Directions: Just place on donors tongue to saturate pad, located on the end of strip, lay next to package to compare the colors. Testing with the Alco-Screen is as easy as placing the pad end of the test strip in the subjects mouth for a few seconds to wet it with saliva. The Alco-Screen requires such a small amount of saliva to activate the test even subjects with dry mouth can be tested successfully. Results are visible within two minutes after wetting with saliva. Because the proportion of alcohol in saliva is directly related to the proportion of alcohol in blood, the Alco-Screen can easily and quickly detect the presence of alcohol and estimate intoxication levels. The presence of alcohol in saliva causes the reagent pad to turn shades of green. Higher concentrations of alcohol create darker shades of green. The operator estimates intoxication levels by comparing the color change against color standards printed on the foil package at the 0.02%, 0.04%, 0.08%, and 0.30% BAC. The Alco-Screen is ideal for agencies with zero tolerance policies. Any green color on the reagent pad after two minutes indicates the presence of alcohol of at least 0.02% or greater. 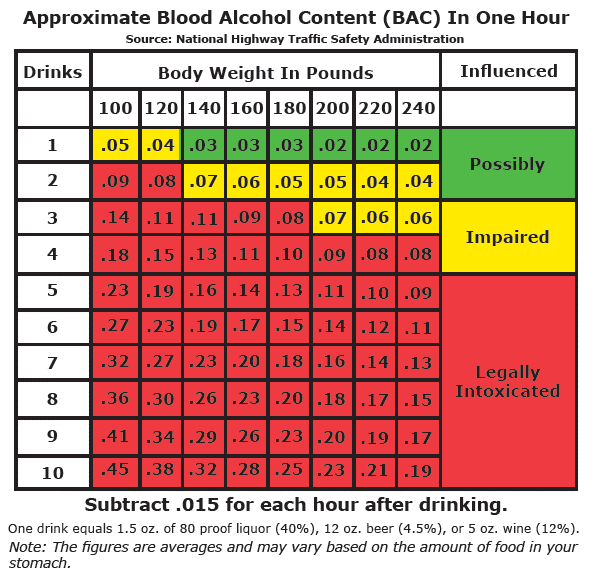 0.02% BAC is about the intoxication from one drink, and is typically the lowest cut-off level used to determine if a person has been drinking alcohol. The Alco-Screen is one of the few devices that can detect the presence of alcohol in beverages. Because the Alco-Screen is calibrated to detect the very tiny amounts of alcohol present in saliva, the color standards on the test do not apply when testing beverages. The concentration of alcohol is extremely high in comparison to saliva. Dipping the strip into a beverage that contains alcohol causes the reagent pad to turn a very dark brown color.